This morning, as the team of short term workers got together to discuss the work for today, they discussed how they would put a gift bag of american candy on each of the students bed this morning. Although Austria has the best chocolate in the world, many of these folks are from Moldova, Russia, Estonia, Tunisia, Poland and so on. Many of them have an annual income less than five hundred dollars, so american candy is to them a treat that they have never experienced because they cannot afford it. As we were talking, one of the ladies asked what they would say if asked by the students where the candy came from. The answer is “it’s a gift”, no more. I thought it was pretty cool when I thought about it. It reminded me of the parking lot ministry (Lifeguards) I work in at home, the workers here and there all have the same mindset, show Christ’s love to everyone, expect nothing in return. When we give a gift to someone, and we wait to see their reaction, or to receive thanks in return, is it still a gift? No, it is not, it then becomes a service rendered that we are awaiting payment in the way of adoration or another gift in turn. To show the Saviors love to all, we must give the gift of service to all we meet, whether they ruffle our feathers or not, we must give the gift of patience and understanding, and we must wrap it all in a warm blanket of love. The Pastors here are so thankful to us, they have come to greet us with a hug on all meetings. They call this place a “Little liece of Heaven” because they are warmly embraced and served by their brothers and sisters in Christ while they they attend the classes given by the professors who have come in. There is no seperation because of origin, there is no bias because of race, we are all just followers of Christ. Helder enters the room, he is a stocky man and he wears a leather viking hat, minus the horns. He hugs Greg around the waist and picks him up off of his feet, (Greg is probably 6′ 3″) old friends reunited again. Helder is a pastor from Estonia. The pastors coming here for training call this place a little piece of Heaven, because it is the closest thing they can imagine to Heaven. There is a fire in their eyes like I have never seen before, a passion to serve the Lord at all cost. As I was bussing the tables after breakfast, a young energetic man thrusts his hand out to shake mine, and introduces himself, he is one of a number of pastors from Moldova, a place that until I looked at the map of northern Europe, I had no idea where it was. He then invited me to come visit with him in Moldova, and I declined politely as I was instructed to do in orientation. In the past, when people have visited the pastor in their homeland, the pastors are known to spend a months wages to make you comfortable for a couple of days, placing themselves in hardship out of graditude to you. Last night I met a pastor from Moldova, he was very reserved as I met him. He explained to me that ninety percent of the country is Muslim. I asked if he had much luck converting muslims to Christ, and he said yes, but that you needed to be careful. If they don’t accept you they rat you out, and Moldova is only partially safe for christians, that is why I am not divulging his name. The staff here is made up of permanent people who live here, long term workers who are here for an undetermined amount of time and may become permanent, and short term workers like me. The long term workers are here for many months (6-9-?) and they come here with no salary, they support themselves, food and a small apartment are provided. They are truly servants of Christ who place themselves at the front line for their faith. We have eighteen Russians coming in tonight, and everyone is fairly excited about that, they have never seen this large a group from Russia before. I watched the wild horses grazing in the meadow of tall grass. They romped and played with one another whinnying and biting. I decided to get a closer shot with my camera and began to stalk. As I crawled through the grass trying to get as close as possible to the rogue herd I noticed the lead horse watching me. He was tall and robust dark brown in color fading to black in his mane and tail. Even though I was as quiet and stealthy as I knew how to be he let me know I wasn’t pulling the wool over his eyes he was on to me right from the start. As I got closer he began to whinny and rise up on his hind legs in a warning to me as if to remind me that it didn’t matter what I did there would never be a saddle on his back or a bit in his mouth. This was a horse in charge of his own future and that was not about to change. I pulled my camera up in an attempt to get a shot before the scene dissolved but was too late. The lead horse had already issued the run order to his minions and the herd charged off into the distance and over a hill, the lead horse throwing one last look of defiance over his shoulder before disappearing over the horizon. I was mad enough to spit. I had been sneaking in on that herd for two hours and I had gained nothing. I walked back toward my truck and was surprised to find that I have walked a couple of miles in my pursuit. As I neared my destination I topped the last hill and was surprised to find another herd of beautiful horses grazing between my truck and me. They were varied in color and just as beautiful as the wild horses but they wore a brand. As I came closer to the horses walking gingerly so as not to scare them, the lead horse actually began to come toward me. He looked at me curiously but without fear as I approached, until he met me in between. I grabbed a handful of grass and began to offer it to the large powerful and tame horse and he eagerly nibbled it from me. I was able to rub his nose and mane as the horse nuzzled up to me. When his friends all saw that I was safe they also came and stood around me in a trustworthy manner also. I was allowed to pet all of them, rub their noses and manes, and take as many close up pictures as I wished with this herd. They were beautiful. As I walked back to my truck, I couldn’t help but wonder why I was so fascinated with the wild horses, when the tame ones had so much to offer. 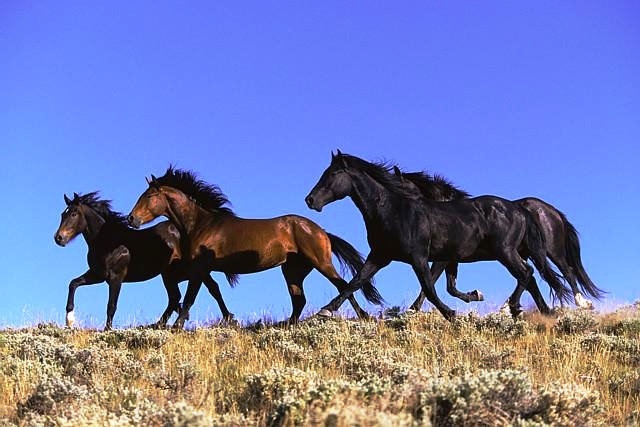 The wild horses were obstinate, without rules or discipline concerned only with their freedom and not at all concerned with contributing to anything that didn’t gratify themselves. The branded horses offered much, in addition to being friendly, they would have carried me, or any burden I had loaded onto them. By being broken and tamed, they had found usefulness and a peace that the wild and selfish horses would never know. The pastor asked to have a word with the female Russian officer, and she stepped over and said “yes”? He said “I wish to speak to you about Christ”, a bold thing to say to any communist officer. She asked him, “Do you love Christ?” to which he replied “yes, with all my heart.” She fell into his arms and began to kiss him again and again, causing him to be somewhat embarrassed, but I kissed her back hoping people would think we were relatives. “I love Christ too” she exclaimed. I took her back to our home, and discovered to my amazement that she knew nothing about Christ, absolutely nothing. She did not know that He is the Savior, where, how, or when He lived and died, or any of His teachings. She explained that Russians are taught by picture association, “a” is for apple, “c” is for cat, etc. She knew that her grandmother always bowed before a picture of this man called the Christos (Christ) and she came to love the name by itself. This name became so real to me, just to say it gave me such joy. In Philippians 2:10 “At the name of Jesus every knee should bow” came to mind. She joyously found Christ in my home and now the One whose name she loved lives in her heart. In countries where the Christians must meet in underground churches, they can best be compared to the first century church. Many times they meet without the benefit of a Bible; many times even the pastors do not have the benefit of being scholarly about the scriptures. They are sometimes very rudimentary in their understanding of the scriptures, but they have the basics, and the basics are what cause the church to swell in times of persecution. Theological discussions and scripture interpretation are a luxury that many in closed countries do not have the benefit of. They have a simple faith that has been passed from one to another in living rooms, in forest clearings, in abandoned buildings or wherever the underground churches have the chance to meet. I remember twenty years ago when I went back to school and they laid out the entire curriculum for the first subject and told us that we would have to memorize huge texts to be successful in the job. Several three inch binders were on the table with hundreds of pages of text, and complex schematic drawings I could not fathom, and it was all linked to my job. If I wanted to do the job, I had to commit it all to memory. I remember how overwhelmed I felt at the time, not feeling worthy of the task. If we are not careful, we can do the same thing to people who are interested in knowing about Christ. We speak Christian-ese, we recite scripture and frighten them with the large texts we carry. A dear friend once asked me “do you think we could get by on just the New Testament, or is the Old Testament also necessary in our walk”. My answer is “neither”, to be able to read either is a privilege that we in the west have been given, but many people who will be in heaven with us have never seen, read, or heard quoted the scripture. I believe we have the tendency to make becoming a Christ follower much more complex than it really is. The plan of salvation was made so simple that most anyone of any IQ can understand it and those who can’t will join us in Heaven anyway. In Matthew 18:1-4 the disciples ask who is the greatest in the kingdom, and Jesus answers them like this. He called a little child and had him stand among them. And he said: “I tell you the truth, unless you change and become like little children, you will never enter the kingdom of heaven. Therefore, whoever humbles himself like this child is the greatest in the kingdom of heaven. Story in beginning is based on real events recorded in the book “Tortured for Christ” by Richard Wurmbrand. I am a pastor with the underground church. My name is Florecu, and I have endured much for my love of Christ. I dare say I have even suffered more than Christ on the cross for my faith. When I was first arrested, my torture began in earnest, it started out easily if you will, merely with knives and red hot iron pokers. What is that, you don’t understand how that is easy, just wait. They began by burning my flesh, trying to get me to give away the members and locations of my underground church brethren. I would go to God quietly and ask Him to give me the strength to endure the suffering without giving away my church, and God granted me that strength. At night they would put me into my cell without dressing my wounds, and they would herd rats in through a pipe, drawn to the scent of my blood and burnt flesh. If I chose to fall asleep, they were on me, eating me alive, so I would not sleep, choosing to stay alert enough to frighten them away when they would come. My captors the communists then chose other forms of torture, they placed me in a standing cell, a narrow vault in which there is no room to even bend ones legs and they forced me to stand for two weeks, day and night. I was able to withstand their torture without breaking time and again, holding out the names and faces of my brethren from the communist Christian hunters. One day, the real punishment began, I heard them coming down the hallway to my cell and I rose to face them, ready to take whatever punishment they were willing to dole out next. That is until Alexander, my 14 year old son was placed before me. The main Jailor began to whip my boy gently at first, then increasing as time wore on. He told us Alex would be whipped until I gave up those in the church, they beat my little boy so hard he has blood running down his back. I was half mad at this point, had bore all I could bear and I began to speak to Alex. Alex, I must say what they want, I cannot bear your beating anymore! The son answered “Father, don’t do me the injustice of having a traitor as a parent. Withstand! If they kill me, I will die with the words on my tongue “Jesus and the Fatherland”. The communists were outraged at this, and they fell upon him heavily and beat him to death. Alex blood covered Florescu’s cell and he was never the same after seeing this. Florescu was eventually released, but the things he saw were so horrible he chose to live the remainder of his life quietly. Florsecu had seen what no man should see, much less what a father should ever see. We like to quote the scripture that say “1 Cor 10:13 No temptation has seized you except what is common to man. And God is faithful; he will not let you be tempted beyond what you can bear. But when you are tempted, he will also provide a way out so that you can stand up under it. This story written closely following the account of brother Florescu and his son Alexander. This story is TRUE. Some excerpts taken from “Tortured for Christ” by Richard Wurmbrand. Well, what are you going to do, the soccer game is going into overtime, and we cannot leave now, Matt would not understand, so we choose the game, and settle in until the end. We normally go to church on Saturday nights and serve on the Sunday morning. Josh has already hinted that he will not be going to church tomorrow, as football season is in full swing not, and he has a couple of games that he just can’t miss. Josh is settled into his chair, his jersey on, bowl of popcorn and a bottle of cold beer ready for kickoff. Our little girl Megan comes out in her Sunday best dress, but she is confused, no-one else is dressed up, so I have to explain to her that there were more important things we had to do today, but we know Jesus will understand, because he loves us so much, Megan nods then goes back to her room to change. Megan is working very hard, she manages a women’s store, actually three of them in her region. She puts in seventy hour weeks, and hardly has time for her new husband Steve. They took a short week off for a honeymoon, but she checked in with the office even while on honeymoon, not wanting to lose control of her department even while away. Steve is somewhat annoyed at Megan’s dedication to her job, mostly because you have to compete with it to get any of her time. Last week Steve wanted to go to a church in the area that they had moved into, it has services Saturday night and Sunday too. He thought it would help to grow together in church, but Megan had no desire to go. When she was growing up, her father always showed the importance of going to church “when” an NFL game wasn’t on. There were fishing trips, soccer games and tournaments that always seemed to conflict with church, and she had noticed they had always won out. Church was dead last in their lives, something you did when no-one was playing, when soccer, baseball, and basketball seasons aren’t going, then you can stop by, if you have nothing better to do. That is how she had decided to run her family. This man wanted to lay his father to rest, yet Jesus told him “Let the dead bury their own dead, but you go and proclaim the kingdom of God.” My footnotes state that he is referring to the spiritually dead burying the physically dead. Jesus wants us to begin the work in earnest, not dawdling but boldly stepping up. When we place things in our schedule that conflict with our worshipping God, are we not being urgent?